There was a time when people believed in heroes who walked among us. Heroes who stepped out upon the sprawling greens of America’s baseball diamonds and performed feats of strength unmatched in the history of sport. In the fall of 1998, after a long summer, Mark McGuire performed one final feat of strength: on September 27 he hit his seventieth homerun of the season, becoming the first player ever to do so, and setting the all time single season homerun mark a full nine higher than the previous record. In 1999, this advertisement, featuring Mark, a bat, a glass of milk, and his famously monstrous biceps and forearms bared for all to see, was published. The baseball bat, which had looked so large in the hands of the great sluggers of yesteryear now looked tiny, almost like a toothpick in the hands of McGuire. To see this advertisement was to see McGuire, the summer of ‘98’s great hero, relaxing with a cool glass of milk. This would clearly denote to the viewer that Mark McGuire drinks Milk. But it would also connote that the source of Mark’s great homerun hitting prowess came from his enjoyment of a cool glass of milk. Thus the message was simple: Drink milk, be like Mark, hit homeruns. For America, which had recently renewed its love affair with baseball, after a bitter strike ended the 1994 season and sent the sports popularity into a freefall, the association of milk with the mythical Mark McGuire, must have been resulted in a prodigious increase in sales. 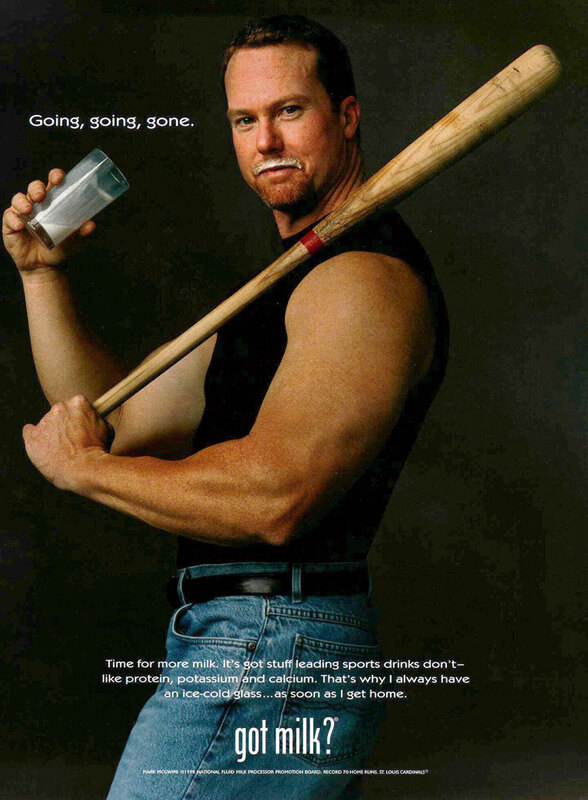 This advertisement not only represented Americans love of Mark McGuire, Milk, and the homerun, but with baseball itself. But, in due time, the mythology of the ad would change drastically. The ad, which had once represented the revival of baseball’s popularity would come to represent the downfall of one of its heroes. The myth had begun to change even before McGuire hit his seventieth homerun of the 1998 season. On August 22nd, CNN/SportsIllutrated had posted an article detailing McGuire’s use of the partially banned steroid “Androstenedione,” know colloquially as Andro. The drug was proven to increase strength and improve recovery, meaning that McGuire’s seemingly superhuman feats were just that: superhuman. By 2005, everything had changed; public outrage over steroid usage in baseball had resulted in Congressional hearings on the subject. McGuire was asked to testify, and in front of the Congressional committee, exercised his Fifth Amendment right to remain silent. With allegations flying, suddenly McGuire was a villain. 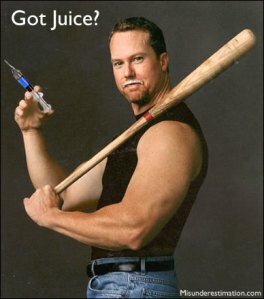 The Myth of McGuire and his milk, of the power hitting savior of baseball, had been eroded and in its place was new image: Mark McGuire and syringe. To look upon the original image would denote the same meaning as in 1999: Mark McGuire Drinks milk. But it would connote something new entirely. The connotation has become that Mark McGuire, once a hero, was a liar, a cheater, and a drug abuser. The American people now knew why the bat looked so small in his hands. His smile, the subtle tilt to his head, the milk mustache, all of it seemingly dripped with deceit. For his actions in the clubhouse and before the US Congress, Mark McGuire lost his hero status. When I look at this advertisement, the connotations I see are likely very different than what most people see. I grew up idolizing Barry Bonds, who, in 2001, would break McGuire’s record by hitting 73 homeruns. He too was implicated in the use of steroids and other performance enhancing drugs. What I see when I look at this image is neither blind admiration nor hatred. What I see is sadness. 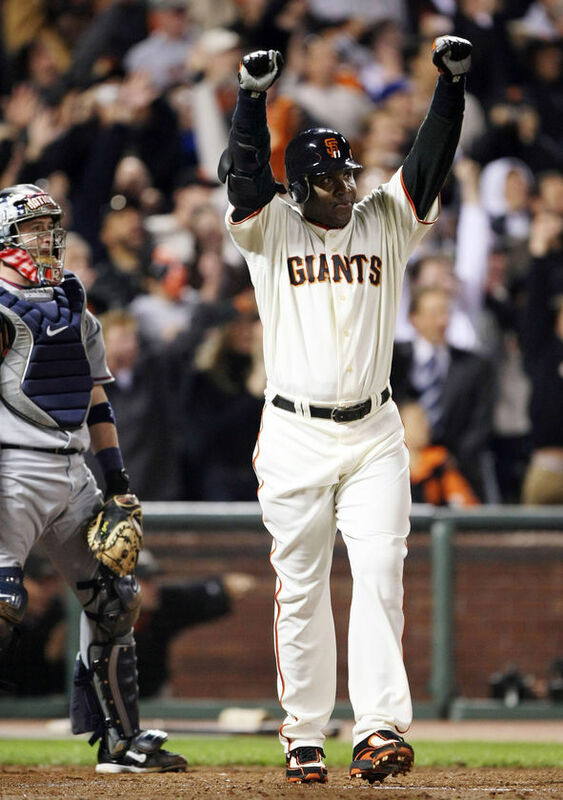 Some of my fondest memories are of Barry Bonds driving a ball deep into the night sky. Of almost blinding camera flashes in the stands behind him. Of Bonds standing, arms raised high, bat falling to the ground, watching as the ball sails high over the fence while the crowd goes wild. In this ad I see sadness and I know that these memories are colored by the revelations of steroid usage in baseball. I see the loss of that childish naivety that every man, woman, and child had when seeing the feats of strength performed by these men. Thus, this advertisement is indeed a stunning example of the mythology of an image, and how that myth can change and vary. As Barthes said, here we “reach the very principle of myth: [where] it transforms history into nature” (Barthes, 114 ). I think you make a very powerful argument here for the mutability of myth. Not only can a myth mean different things to different people based on their education, experience, or disposition, but it can change over time as our culture changes. I concur with your feeling of sadness and disappointment, but I think this phenomenon is sad on a deeper level too. The athlete is celebrated by the media (the myth-producers) for its own benefit, and the athlete is then demonized by the media for its own benefit. In the end, it is only the athlete that takes the blame, the myth-producers – who pressured him to be superhuman – remain innocent.